Abandoning nationalist rhetoric and the zero-sum framing of the Dialogue is a critical condition for achieving a genuine normalisation of relations. While the Serbian government must not attempt to block the membership of Kosovo in international organisations, or to obstruct the functioning of Kosovo’s legal system by keeping control over the north, the government in Pristina must ensure a more substantial inclusion of ethnic Serbs, and foster a society based on the principles of equality and non-discrimination (EUISS, April 2018: 'Belgrade and Pristina: lost in normalisation?') . (The Republic of) Kosovo wants to join the European Union. The EU operates comprehensive approval procedures that ensure new members are admitted only when they can demonstrate they will be able to play their part fully as members, namely by complying with all the EU's standards and rules, having the consent of the EU institutions and EU member states and having the consent of their citizens – as expressed through approval in their national parliament or by referendum. - the ability to take on and implement effectively the obligations of membership, incl. adherence to the aims of political, economic and monetary union. The President of Kosovo, invited by the Dutch Institute for International Relations “Clingendael” held a lecture in The Hague on “Vision, challenges, and possibilities for Kosovo” in front of many state representatives, diplomats, journalists and representatives of the civil society. He said that The Hague is the place where Kosovo’s independence was legally confirmed by the International Court of Justice. He said that after this advising opinion in 2010, the political dialogue between Kosovo and Serbia started, which produced a historic agreement in Brussels, five years ago. “This happened after 100 years of conflict,” Thaci said. He added that The Hague is of course also the place where a part of the Kosovo justice system is currently established, by proving Kosovo’s readiness to always cooperate with the international justice. “We are proud of our war for freedom and we have nothing to neither hide nor fear the truth. No one has ever tried to escape of hiding from justice, compare to the other countries in the region,” Thaci said. 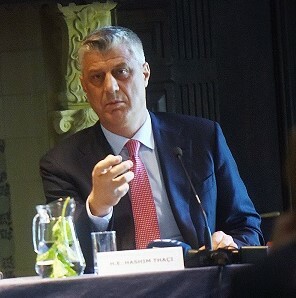 Speaking about the challenges of Kosovo, Thaci said the main one remains conclusion of the dialogue with Serbia. To move forward with the international recognition of Kosovo's independence, therefore we met representatives of 30 non-recognizing countries, thereby those representatives were positive with regards to recognizing Kosovo. So, I can freely state that by the end of this year three countries will recognize Kosovo's independence and some of these countries will have particular weight in recognitions to be announced in the following weeks or months". The third focus was to ensure votes for Kosovo upon applying for membership in various international organizations. Discussed was also the advancement of relations between Kosovo and NATO and cooperation with different multilateral organizations. The EU reserves the right to decide when candidate countries can join. It also needs to be able to integrate new members. What is negotiated? The conditions and timing of the candidate's adoption, implementation and enforcement of all current EU rules (the "acquis"). These rules are divided into 35 different policy fields (chapters), such as transport, energy, environment, etc., each of which is negotiated separately and they are not negotiable if candidates essentially agree on how and when to adopt and implement them and/or when the EU obtains guarantees on the date and effectiveness of each candidate's measures to do this. Other issues discussed are financial arrangements (such as how much the new member is likely to pay into and receive from the EU budget (in the form of transfers), and transitional arrangements (sometimes certain rules are phased in gradually, to give the new member or existing members time to adapt). Throughout the negotiations, the Commission monitors the candidate's progress in applying EU legislation and meeting its other commitments, including any benchmark requirements. This gives the candidate additional guidance as it assumes the responsibilities of membership, as well as an assurance to current members that the candidate is meeting the conditions for joining. The Commission also keeps the EU Council and European Parliament informed throughout the process, through regular reports, strategy papers, and clarifications on conditions for further progress. On April 10th, Foreign Ministery of (the Republic of) Kosovo exchanged views on rapprochement with the European Union in order to satisfy the conditions for the negotiations for a Stabilisation and Association Agreement. Five years of independence have passed. What are the achievements and challenges? In its existence as a sovereign and independent country, (the Republic of) Kosovo has made monumental progress in the (state)nation-building process. During the lecture, topics as the legal status of (the Republic of) Kosovo, relations with Serbia, building the rule of law, protection of minorities, the fight against corruption and organized crime, and international trade relations raised. 'With a population of 2 million people, and to fulfil EU-condition to improve regional cooperation, attention is paid to transport, infrastructure, energy shortages, cross border criminal activities, and political challenges inherited from the past. To determine the final status, also recognition is part of policy and that policy is currently rather a comfortable one. On economy figures were presented for debt and GDP but pointed was that interaction of the conditions should be present to achieve progress. The issue of power structure remains difficult, which occurs when the two capitals to join a region. We have to find a kind of understanding, but there is momentum now to look forward and the construct a program on how to talk and to act for dialogue'. The strategy on Digital Diplomacy assists in any case Kosovo’s recognition by the global internet infrastructure'. Unless something gives, Kosovo is set for a major clash on Friday. Roadblocks have gone up in the north of the country. Armoured convoys of NATO-led peacekeepers are heading for the north, along with black armoured vehicles belonging to the European Union’s police mission, EULEX. At the Serb-controlled barricade at the village of Rudare several lines of defence have been put in place: logs, tyres, gravel and pallets of bricks. At their head is a large picture of Vladimir Putin, Russia's Serbia-friendly prime minister. These developments are part of a long-simmering row over customs stamps. In July Kosovo's government sent special police units to seize the two border points with Serbia it didn't control. The Serbs, who reject the authority of Kosovo’s government in Pristina and predominate in the north, threw up barricades, thwarting the Kosovars. 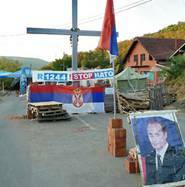 NATO-led peacekeepers took over the two crossings—but their mandate expires on Thursday. But Kosovo's authorities then said they would deploy customs officers to the border crossings, supported by KFOR (NATO's peacekeeping force) and EULEX. Serbia's leaders responded that sending officials to the border had nothing to do with customs stamps. Petrit Selimi, Kosovo’s deputy foreign minister, wondered where customs officers were supposed to stamp goods, if not on the border. The issue could have serious political ramifications. On October 12th the European Commission will give its opinion on whether Serbia should become an official candidate for EU membership. If officials in Brussels believe that Serbia is not co-operating on Kosovo it is unlikely to get the green light. Serbia's government had hoped to win candidacy and take this triumph to the voters in early elections, perhaps next April. A sense of trepidation was palpable yesterday in northern Kosovo, as I visited two Kosovo Serb television stations. (Four such stations, in a project supported by IREX, are sharing programming under the umbrella name TV Mreza, giving Kosovo Serbs access to local news produced by local stations rather than the big Serbian channels in Belgrade.) In Zvecan, TV Most is housed in an old building overlooking part of the the sprawling and long-defunct Trepca mining and smelting complex. Serbian refugees from other parts of Kosovo live downstairs. Zvonko Miladinovic, who runs the station, says that its name—“most” means “bridge”—speaks for itself. “Our motto is to prepare our people for the future, to live together with Albanians,” he says. Although Kosovo's difficulties are concentrated in its north, only about a third of the country's 130,000 Serbs live there. The rest are in enclaves scattered over the centre and south of the country. In Silovo, near Gjilan (Albanian) or Gnjilane (Serbian), in the east of the country, I went to meet Nenad Milenkovic, head of TV Puls. There are some 40,000 Serbs in this region. Of the four linked stations only TV Puls is carried on a cable network that covers all of Kosovo. Things seem rather relaxed here. Next door a Kosovo Serb doctor, once a politician known for his hardline views, is treating a stream of Albanian patients. But the area is not trouble-free, says Mr Milenkovic, citing examples of alleged police violence. He also says that many Serbs suffer the theft of their cows. One of his problems is that Albanian companies don’t want to advertise on TV Puls “because many of them think they will lose their Albanians customers if they do.” As I leave, I walk past gaggles of teenagers on the street. 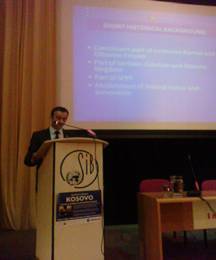 Mr Milenkovic says that many of them, if not most, will leave Kosovo after graduating because there are no jobs. That is a problem that Serbs and Albanians share. But for the moment it is not on the agenda. 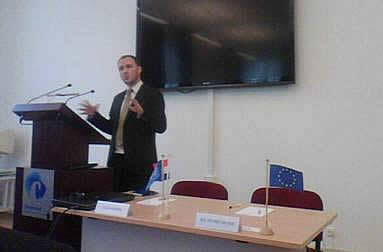 On Tuesday 22 February 2011, His Excellency Mr Nexhmi Rexhepi - the Ambassador of the Republic of Kosovo to the Kingdom of Netherlands - delivered a lecture entitled: "Kosovo, factor of stability in the region". This lecture was organized by ALB FACT (the Albanian Factor in South Eastern Europe) and in cooperation with NGIZ (Utrecht) and SIB (Utrecht). 'After Balkan wars of the 1990's, South Eastern Europe seems to be heading for a new era. Reconciliation and reconstruction were initial keywords. Security and stability followed next. Integration and participation are today's magical expressions. Obviously, one case differs from the other. That is exactly what the ALB FACT project seeks to demonstrate: while they may have certain factors in common, like the Albanian factor, each and every Balkan country is unique. Kosovo has seek ethnic polarisation and escalation to the extreme. Since NATO's Operation Allied Force (1999) conflict in Kosovo is over. Looking beyond the standards & status stage; recognition issues and recent elections, a new situation comes to the fore: one of profound predictability. The question is whether we can already speak of stability, in light of pending issues both risks and opportunities. what is the status of the 'Belgrade' - Pristina dialogue? Are all communities in the Republic of Kosovo equally pleased with the current majority - minority situation? Is the future placed in parallel structures, or in developments like the 'North Mitrovica Initiative'? How will the new government move ahead? What are Kosovo perspectives for Euro-Atlantic integration? Is an international presence (EULEX/ICO/KFOR) still required and if so for how long? Is there also negative international interference and if so why? Will the country continue to rely on remittance funds or will Foreign Direct Investments and emerging tourism be the answer to ensure peace and prosperity? A paper 'Kosovo's new map of power: governance and crime in the wake of independence', dated May 2011 by Netherlands Institute of International Relations Clingendael gives a clear insight in the present state and progress. In alsmost a full house the ambassador recalled the controversial as the 3 years of independence and figured out countries and supranational institutions that did recognized the independence: NATO, G8, Council of Europe, EU, OSCE. There is a roadmap to the future. Constitutional order, strengthening the rule of law and democracy, implementing international obligations, creating conditions for Kosovo Serbs to govern decentral their own local affairs and protection of religious and cultural heritage are all on the agenda -> Presentation slides H.E. Nexhmi Rexhepi. While Serbia's sovereignty is recognised by the international community, in practice Serbian governance towards Kosovo was virtually non-existent (see Constitutional status of Kosovo, accordance with international law of the unilateral declaration of independence in respect of Kosovo, Advisory Opinion of 22 July 2010 ). Kosovo is governed by the United Nations Mission (UNMIK), assisted by an EU-mission (EULEX) and the local Provisional Institutions of Self-Government, with security provided by the NATO-led Kosovo Force (KFOR). Kosovo has one of the most under-developed economies in Europe. Despite substantial development subsidies from all Yugoslav republics, Kosovo was the poorest province of Yugoslavia. Additionally, over the course of the 1990s a blend of poor economic policies, international sanctions, poor external commerce and ethnic conflict severely damaged the economy.Kosovo's economy remains weak. After a jump in 2000 and 2001, growth in Gross Domestic Product (GDP) was negative in 2002 and 2003 and is expected to be around 3 percent 2004-2005, with domestic sources of growth unable to compensate for the declining foreign assistance. Inflation is low, while the budget posted a deficit for the first time in 2004. Kosovo has high external deficits. In 2004, the deficit of the balance of goods and services was close to 70 percent of GDP. Remittances from Kosovars living abroad accounts for an estimated 13 percent of GDP, and foreign assistance for around 34 percent of GDP. Most economic development since 1999 has taken place in the trade, retail and the construction sectors. The private sector that has emerged since 1999 is mainly small-scale. The industrial sector remains weak and the electric power supply remains unreliable, acting as a key constraint. Unemployment remains pervasive, at around 40-50% of the labor force.UNMIK introduced de-facto an external trade regime and customs administration on September 3, 1999 when it set customs border controls in Kosovo. All goods imported in Kosovo face a flat 10% customs duty fee. These taxes are collected from all Tax Collection Points installed at the borders of Kosovo, including those between Kosovo and Serbia. UNMIK and Kosovo institutions have signed Free Trade Agreements with Croatia, Bosnia and Herzegovina, Albania and Macedonia. FYR Macedonia is Kosovo's largest import and export market (averaging €220 million and €9 million, respectively), followed by Serbia-Montenegro (€111 million and €5 million), Germany and Turkey. The Euro is the official currency of Kosovo and used by UNMIK and the government bodies. The Serbian Dinar is used in the Serbian populated parts. The economy is hindered by Kosovo's still-unresolved international status, which has made it difficult to attract investment and loans. The province's economic weakness has produced a thriving black economy in which smuggled petrol, cigarettes and cement are major commodities. The prevalence of official corruption and the pervasive influence of organised crime gangs has caused serious concern internationally. The United Nations has made the fight against corruption and organised crime a high priority, pledging a "zero tolerance" approach. Culture and music has always been a part of the Albanian and Serbian culture. Although in Kosovo music is diverse (as it got mixed with the cultures of different regimes dominating in Kosovo), authentic Albanian music and Serbian music do still exist. The Albanian one is characterized by use of çiftelia (an authentic Albanian instrument), mandolin, mandola and percussion. In Kosovo, along with modern music, folk music is very popular. Classical music is also well known in Kosovo and has been taught at universities (at the University of Prishtina Faculty of Arts and the University of Priština at Kosovska Mitrovica Faculty of Arts) and several pre-college music schools. The modern music in Kosovo has its origin from the Western countries. The main modern genres include: Pop, Hip Hop, Rock and Jazz. WHAT is 'JUST' SECESSION? KOSOVO UNIQUE (ESF Working paper February 2008, a joint initiative of CEPS, IISS, DCAF and GCSP). Ever since the option of supervised independence for the Republic of Kosovo emerged as the preferred status option within the EU, its diplomats have been propagating a view of Kosovo as a unique case. The governments of countries confronted with secessionist conflicts have to be convinced that the EU policies on Kosovo will not turn against them. Area total 10,887 km² / 4,203 sq mi. Population 2005 estimate 2.2 million. Currency Euro. The Serbian dinar is used in Serbian enclaves and North Kosovo. Kosovo is a region south Serbia which has been under United Nations administration since 1999. While Serbia's sovereignty is recognised by the international community, in practice Serbian governance in the province is virtually non-existent (see also Constitutional status of Kosovo). Kosovo is governed by the United Nations Mission in Kosovo (UNMIK) and the local Provisional Institutions of Self-Government, with security provided by the NATO-led Kosovo Force (KFOR). The Province of Kosovo borders Montenegro, Albania, and the Republic of Macedonia. It has a population of just over two million people, predominantly ethnic Albanians, with smaller populations of Serbs, Turks, Bosniaks, Romani people, and other ethnic groups. The area is the subject of a long-running political and territorial dispute between the Serbian (and previously, the Yugoslav) government and Kosovo's largely ethnic-Albanian population. International negotiations began in 2006 to determine the final status of Kosovo. Mythmoulding around "Serbian's Holy land" Kosovo is founded on a selective national memory. Serbia historiographers don't mention that during the lost battle against the Turks in 1389 on the blackbird-field in Kosovo also Albanese, Hungarian and other troops did fight. In 1974, during Tito's Yugoslavia, Kosovo did obtain extreme autonomy. This situation conducted tensions. Serbians did feel oppressed by Albanians and it became a breeding ground for a campaign, discovered Slodbodan Milosevic, who in June 1989 on the same blackbird-field, 600 years after the famous battle, by a fierce nationalistic speech raptured more than one million Serbians. Milosevic finished the autonomy in Kosovo and his battering line of action took care of great unrest within the Yugoslavian federation. War and the demolitian were the results. Resolutie 1244 of the Security Council of the United Nations points out that all member-states are devoted to sovereignty and territorial integrity of the federal republic of Yugoslavia. Also she foresees in a temporary politic framework-agreement, that foresees in a considerable mate of self-government concerning Kosovo with complete respect to the principles of the sovereignty and the territorial integrity of the Yugoslavia Republic. The issues concerning Serbia and Montenegro's cooperation with Yugaslavian-Tribunaal and the ICTY and the still current affairs at the IG have to come to a solution. 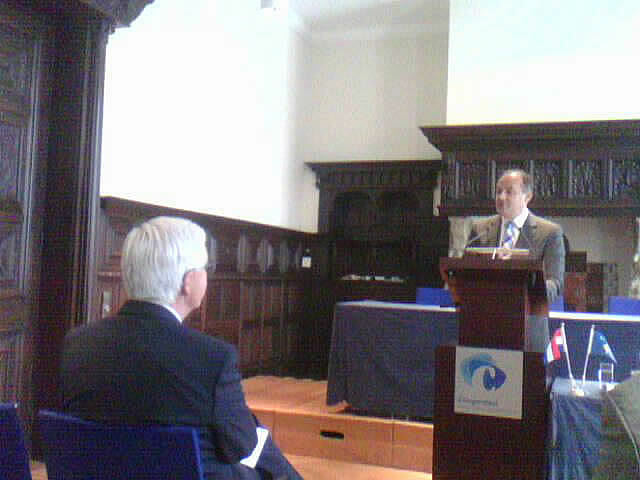 However, it may not be in somebodies way of the accession of Serbia and Montenegro to the Partnership for Peace. Niemand die ook maar iets geeft om de stabiliteit in zowel Servië en Montenegro en de bredere regio kan toch wensen dat het land geen toegang heeft tot dit mechanisme, dat een van de meest effectieve mechanismes is om te reageren op de moderne veiligheidsbedreigingen en -uitdagingen. Als Servië en Montenegro buitengesloten blijven worden van het Partnerschap voor de Vrede, zullen allerlei samenzweringstheorieën in ons land weer opvlammen en voorziet men de extremisten alleen maar van nieuwe ammunitie. Progressive elements in Serbia and Montenegro wants to achieve a more open and human approach by NATO, and with respect to the NATO. The policical elite as citizens have to fully confront their past, but they have already made big steps in that direction. Wounds of the recent past and especially the NATO air-attacks are staying intense. A sign of regret by the NATO due to the death of civilians who died during these attacks, would be conductive to the healing process and help the Serbian and Montenegrin authorities for their plea for more international cooperation - also cooperation with Yugoslavian Tribunal - at public at large. Serbia and Montenegro need a policy focussed on inserting of countries in the international community in stead of exclusion. Our future prosperity and welfare is tied to international cooperation and entrance to the process of Euro-Atlantic integration. An invitation of the NAVO during the Top of Istanbul or as soon as possible after that, to join to the Partnership for Peace, would be a fantastic first step. to get it right in the sort run"
The last disputed region of the now defunct communist Yugoslavia, the province of Kosovo has an extensive and rich history. Inhabited by several different groups, it was initially (circa 1300 B.C.E.) inhabited by Illyrians, which eventually became incorporated into the Roman empire and subsequently the Byzantine empire. From c. 6th century AD it was settled by Slavs (Serbians) migrating from the north. It was conquered by the Ottoman empire during their take-over of south-eastern Europe. However, it was re-occupied by the Serbs after the defeat of the Ottoman Empire in the 1912-13 Balkan Wars. Kosovo has since been a region or province of modern Yugoslavia and its successor state of Serbia. The Kosovo region has been taken, retaken, and ruled by several empires. It lies both on the outer fringes of the Byzantine Empire and directly in the path of Slavic invasions in the 5th and 6th centuries, culminating with the arrival of White Serbs in the first half of the 7th who formed the realm of Rascia, the center of which was in northwest Kosovo. From 863 to 971, most of the remainder of Kosovo was ruled by Bulgaria, cementing the slavic character of Kosovo. Various Slavic rebellions wanted to restore the Bulgarian Empire, like the one from Macedonia in 976 to 1014 or the one raised in the 1040s. The Serbs from Doclea also tried in 1070 to 1072 to restore the Bulgarian Empire, but they were defeated in the Battle of Sitnica. From the 1090s, most of Kosovo is incorporated into the Grand Principality of Rascia under the Vukanović family. 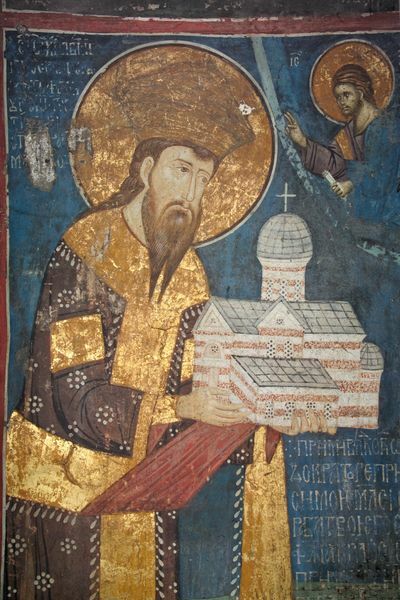 Although it would not be until 1208 that Grand Prince Stefan Nemanjić would finally conquer Prizren that Kosovo got fully incorporated into Serbia. During the rule of the Nemanjić dynasty, many Serbian Orthodox churches and monasteries were built throughout Kosovo. Kosovo became the core of the Serbian realm in the second half of the 13th and in the 14th century; the Nemanjić rulers alternatively used both Prizren and Priština as their capitals. Large estates were given to the monasteries in Metohija (Western Kosovo) (which included parts of modern-day Albania and Montenegro). 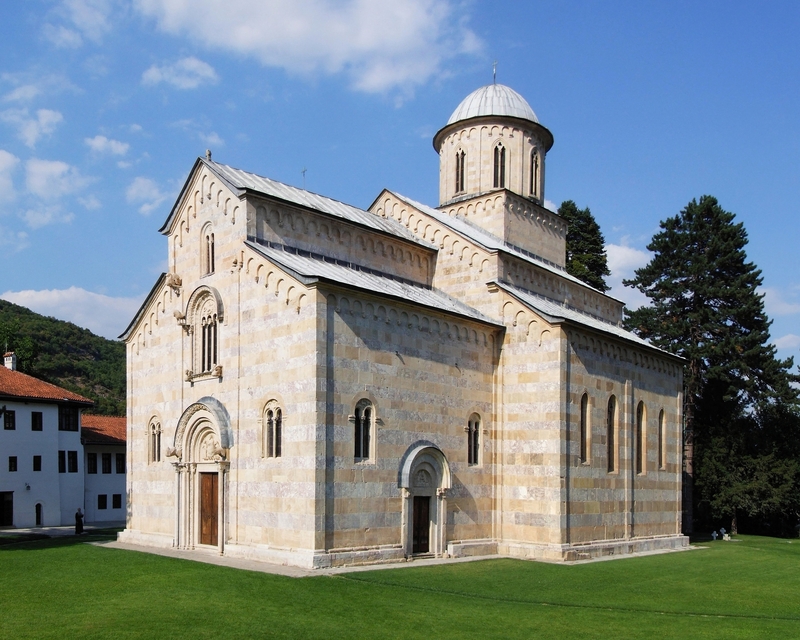 The most prominent churches in Kosovo - the Patriarchate at Pec, the church at Gračanica and the monastery at Visoki Dečani near Dečani - were all adopted during this period. At the end of the 13th century, Pec became the center of the Serbian Orthodox Church, which became a Patriarchate in 1346. Kosovo was economically important, as the modern Kosovo capital Priština was a major trading centre on routes leading to ports on the Adriatic Sea. As well, mining was an important industry in Novo Brdo and Janjevo which had its communities of émigré Saxon miners and Ragusan merchants. Ethnic identity from the Middle Ages was somewhat fluid throughout Europe, and people at that time do not appear to have defined themselves rigidly by a single ethnic identity. Those of Slavic origin, particularly of the Serbian background, appear to have been the dominant population culturally and were probably a demographic majority as well. In the second half of the 14th century the Serbian Empire fell into feudal anarchy on the death of Tsar Stefan Dušan and local fiefdoms rose to power and prominence in their respective lands, with Kosovo becoming a Lordship under the Branković dynasty. The Ottoman Emirate took the opportunity to exploit Serbian weakness and invaded, with the epic Battle of Kossovo occurring in 1389. In 1455, the Ottoman Empire conquered Kosovo from Serbia. The Ottomans brought Islamisation with them, particularly in towns, and later also created the Vilayet of Kosovo as one of the Ottoman territorial entities. Ottoman rule lasted for about 500 years, in which time the Ottomans were the absolute paramount power in the region. Many Christians adopted Islam, particularly many Bosnians and Albanians, whose populations became predominantly Islamic. The Ottomans administered through a millet system- based on religion- whereby Muslim subjects received more tax concessions and personal liberties compared to Christians and Jews. Kosovo was taken temporarily by the Austrian forces during the War of 1683–1699 with help of Serbs. After the Austrians retreated, many Serbs had to flee from Kosovo to evade Ottoman reprisals. In 1690, the Serbian Patriarch of Peć Arsenije III, who previously escaped a certain death, led 37,000 families from Kosovo, to evade Ottoman wrath. The people that followed him were mostly Serbs —but they were likely followed by Christians of other ethnic backgrounds. The Albanian people of the area also continued to intermittently struggle against occupation, yet suffered less reprisals at the hands of the Ottomans. Quite a few rose to prominence in the Turkish system, as administrators and as soldiers. During this time, many Albanians moved into Kosovo, filling in lands and houses vacated by fleeing Christians. Whilst relations between Serbs and Albanians were peaceful initially, this eventually deteriorated. At the outset, Christians and Muslim-converts celebrated each other's religious holidays together. However, later, many young Albanian Islamics participated in Turkish massacres of Christians, which in turn would be retaliated upon by the Serbs when they got the upper hand. This period has by many been identified as the catalyst of the subsequent deterioration of the relationship between Serbian and Albanian peoples. Apart from religious tensions, the subsequent political outlook changed for the two people. As the Ottoman empire began to collapse, Serbia aimed to re-incorporate Kosovo into the heart of its realm, whereas many Albanians were content with their new-found authority within the Ottoman system. With ongoing oppression from the Ottomans, migrations of Christian people out of Kosovo continued until the Ottoman empire finally collapsed. Many Serbs (and Vlachs) moved to Vojvodina and the Krajina region. Also, many of the minority of Albanians that remained Christian also migrated to towns in Dalmatia. During the 19th Century part of modern Kosovo was reintegrated in to 'Old Serbia' following a Peace Accord of 1878 which brought the cities of Priština and Kosovska Mitrovica under Serbian control whilst leaving the remainder of Kosovo under Ottoman authority. An ethnic-Albanian Prizren League was formed which sought to unite all of the Albanian provinces of the Ottoman Empire, but which was ultimately defeated by Ottoman forces. During the First Balkan War of 1912 most of Kosovo was retaken by the Kingdom of Serbia while the region of Metohija (know as the Dukagjini Valley to ethnic-Albanians) was taken by the Kingdom of Montenegro. Populations of ethnic Serbs and Albanians tended to shift following territorial conquests. During World War I, Kosovo was occupied by the Bulgarian and Austro-Hungarian forces following a serious defeat of Serbian and allied armies in 1915. Returning in 1918, the Serbian army pushed the central powers out of Kosovo as the war came to a close. Following WWI, the Kingdom of the Serbs, Croats and Slovenes was formed, bringing together Serbian Kosovo and Montenegrin Metohija within the new kingdom. The partition of Yugoslavia by the invading Axis Powers from 1941 and 1945 awarded most of the territory to the Italian-occupied Greater Albania, and a smaller part of it to German-occupied Serbia and Greater Bulgaria. Both wars were occasions for inter-ethnic violence and both voluntary and forced population shifts. Following the end of the war and the establishment of Tito's Communist regime, Kosovo was granted the status of an autonomous region of Yugoslavia in 1946 and became an autonomous province in 1963. With the passing of the 1974 Yugoslavia constitution, Kosovo gained self-government. Throughout the 1980s tensions between the Albanian and Serb communities in the province escalated. The Albanian community favoured greater autonomy for Kosovo, whilst Serbs favoured closer ties with the rest of Serbia. There was little appetite for unification with Albania itself, which was ruled by a Stalinist government and had considerably worse living standards than Kosovo. Beginning in March 1981, Kosovo Albanian students organized protests seeking that Kosovo become a republic within Yugoslavia. Those protests rapidly escalated into violent riots "involving 20,000 people in six cities" that were harshly contained by the Yugoslav government. Serbs living in Kosovo complained at discrimination from the provincial Kosovo government (run by the ethnic-Albanian dominated Communist Party of Kosovo) and neglect from the Federal authorities in Belgrade. In August 1987, during the dying days of Yugoslavia's Communist regime, Kosovo was visited by Slobodan Milošević, then a rising politician. Milošević capitalised on this discontent to consolidate his own position in Serbia. In a staged event, having drawn huge crowds to a rally commemorating the Battle of Kosovo, he pledged to Kosovo Serbs that "No one should dare to beat you", and became an instant hero of Kosovo's Serbs. By the end of the year Milošević was in control of the Serbian government. In 1989, the autonomy of both Kosovo and of Vojvodina were drastically reduced by a new Serbian constitution which allowed a multi-party system, introduced freedom of speech and promoted human rights. Though later subverted by Milošević's abuses, the new constitution was a significant step forward from the previous Communist constitution. However, the new constitution also significantly reduced the rights of the two previously autonomous provinces, giving control of many areas directly to the Government of Serbia, including control of the police, the court system, the economy, the education system and language policies. Differing viewpoints see either an attempt to gain control of a crisis-ridden province or a cynical exploitation of nationalist politics. When called to ratify the new constitution in March 1989, the assemblies of the provinces were met with tanks and armoured cars, effectively forcing the delegates to accept the amendments. Kosovo Albanians boycotted state institutions and elections and established separate Albanian schools and political institutions. On July 2, 1990, an unofficial Kosovo parliament declared Kosovo independent, though this move was recognised only by Albania. In 1992, the parliament organised an unofficial referendum, observed by international organizations not recognized internationally, which saw a 98% vote of the Kosovo Albanian majority for independence. Under the leadership of Ibrahim Rugova, the Albanians in Kosovo conducted a peaceful resistance to Serb rule. In 1995, after the Dayton Agreement which ended the Bosnian War, but did not address Kosovo, many Albanians became disenchanted with Rugova's peaceful strategy. Consequently, the Kosovo Liberation Army (KLA) was formed in 1996 with the goal of attaining an independent Kosovo. Other KLA factions fought with the goal of uniting all the Albanian populated lands and some simply to defend Kosovo Albanians from Milosevic's regime, but they were joined together by the common objective of defeating what they saw as Serb oppressors. They employed guerilla-style tactics against Serbian police forces, paramilitaries and regular civilians. Violence escalated in a series of KLA attacks and Serbian reprisals into the year 1999, with increasing numbers of civilian victims. Some sources allege that western security forces and Al Qaeda both had roles in supporting the KLA. In 1998 the Yugoslav authorities were forced to sign a unilateral cease-fire and partial retreat. Under an agreement led by Richard Holbrooke, OSCE observers moved into Kosovo to monitor the ceasefire, while Yugoslav military forces partly pulled out of Kosovo; neither side kept the ceasefire fully. A massacre of Albanians by Serbian military at the town of Racak in January 1999 increased international concern at Milosevic's actions. The subsequent Rambouillet conference fell apart after Milosevic refused to sign an agreement which would give Kosovo equal status as a Republic and which purportedly would give NATO forces access rights to all of Yugoslavia. This triggered a 78-day NATO campaign in 1999. At first limited to military targets in Kosovo itself, the bombing campaign was soon extended to cover military or related targets that supported military troops all over Yugoslavia, including bridges, power stations, factories, broadcasting stations, the transportation network, and various government buildings. During the conflict roughly a million ethnic Albanians fled from Yugoslav forces or were forcefully driven by Yugoslav forces from Kosovo, several thousand were killed (the numbers and the ethnic distribution of the casualties are uncertain and highly disputed). An estimated 10,000 ethnic Albanians and 3,000 Serbs are believed to have been killed during the conflict. Some 3,000 people are still missing, of which 2,500 are Albanian, 400 Serbs and 100 Roma. The conflict ended with an agreement signed by both Yugoslavia and NATO at Kumanovo in Macedonia on 9 June 1999 and with United Nations Security Council Resolution 1244 which, whilst recognising Serbian sovereignty, authorised an international civil and military presence in Kosovo, placing it under interim UN administration with a NATO-led peacekeeping force (KFOR). With the withdrawal of Serb forces, ethnic-Albanian refugees began returning from Albania and the Republic of Macedonia. In fear of their safety, perhaps up to 250,000 Serbs and other ethnic minorities fled their homes north. Many displaced Serbs fear to return and around 120,000-150,000 Serbs remain in Kosovo, but remain in a difficult security and economic situation. In March 2004, Kosovo experienced its worst inter-ethnic violence since the Kosovo War. The unrest in 2004 was sparked by a drowning of Albanian children in the Ibar river. Unfortunately the cause of this event has not yet been determined. Taking advantage of the situation, numerous Albanian extremists in several locations in Kosovo burned Serbian houses, Serbian Orthodox Church sites (including some medieval churches and monasteries) and UN facilities. Huge mobs of hooligans purged several Serbian villages. Kosovo Police established a special investigation team to handle cases related to the 2004 unrest and according to Kosovo Judicial Council by the end of 2006 the 326 charges filed by municipal and district prosecutors for criminal offenses in connection with the unrest had resulted in 200 indictments: convictions in 134 cases, and courts acquitted eight and dismissed 28; 30 cases were pending. International prosecutors and judges handled the most sensitive cases. International negotiations began in 2006 to determine the final status of Kosovo, as envisaged under UN Security Council Resolution 1244 which ended the Kosovo conflict of 1999. Whilst Serbia's continued sovereignty over Kosovo is recognised by the international community, a clear majority of the province's population would prefer independence. The UN-backed talks, lead by UN Special Envoy Martti Ahtisaari, began in February 2006. Whilst progress was made on technical matters, both parties remained diametrically opposed on the question of status itself. In February 2007, Ahtisaari delivered a draft status settlement proposal to leaders in Belgrade and Pristina, the basis for a draft UN Security Council Resolution which proposes 'supervised independence' for the province. As of early July 2007 a draft resolution, backed by the United States, the United Kingdom and other European members of the Security Council, had been rewritten four times to try to accommodate Russian concerns that such a resolution would undermine the principle of state sovereignty. Russia, which holds a veto in the Security Council as one of five permanent members, had stated that it would not support any resolution which was not acceptable to both Belgrade and Kosovo Albanians. Whilst most observers had, at the beginning of the talks, anticipated independence as the most likely outcome, others have suggested that a rapid resolution might not be preferable. 17 Februari 2008 Kosovo declared itself an independent state.